The cafe is not only a place to enjoy a cup of coffee, it is also a space - distinct from its urban environment - in which to reflect and take part in intellectual debate. Since the eighteenth century in Europe, intellectuals and artists have gathered in cafes to exchange ideas, inspirations and information that has driven the cultural agenda for Europe and the world. Without the café, would there have been a Karl Marx or a Jean-Paul Sartre? The café as an institutional site has been the subject of renewed interest amongst scholars in the past decade, and its role in the development of art, ideas and culture has been explored in some detail. However, few have investigated the ways in which cafés create a cultural and intellectual space which brings together multiple influences and intellectual practices and shapes the urban settings of which they are a part. This volume presents an international group of scholars who consider cafés as sites of intellectual discourse from across Europe during the long modern period. Drawing on literary theory, history, cultural studies and urban studies, the contributors explore the ways in which cafes have functioned and evolved at crucial moments in the histories of important cities and countries - notably Paris, Vienna and Italy. Choosing these sites allows readers to understand both the local particularities of each café while also seeing the larger cultural connections between these places. 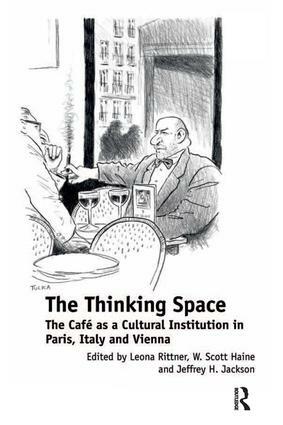 By revealing how the café operated as a unique cultural context within the urban setting, this volume demonstrates how space and ideas are connected. As our global society becomes more focused on creativity and mobility the intellectual cafés of past generations can also serve as inspiration for contemporary and future knowledge workers who will expand and develop this tradition of using and thinking in space. Leona Rittner, who died in 2010, was an independent scholar based in New York and published widely on French and Italian literature; W. Scott Haine teaches at the University of Maryland University College; Jeffrey H. Jackson is Associate Professor of History at Rhodes College in Memphis, Tennessee.